In the face of skepticism in Congress, health officials tried to assure the nation Thursday that they can head off an Ebola outbreak in the U.S. despite mistakes that let the deadly virus spread to two nurses and cleared one of them to fly. The revelation that one of the hospital nurses was allowed on a commercial airline the day before she was diagnosed raised new alarms about the U.S. response to the Ebola outbreak in West Africa. Some lawmakers pressed for a ban on travel to the U.S. from the region -- a course President Barack Obama is resisting. The death toll is expected to climb above 4,500 in Africa, all but a few within Liberia, Sierra Leone and New Guinea, the World Health Organization said. Obama directed his administration to respond in a "much more aggressive way" to the threat and, for a second day in a row, canceled his out-of-town trips to stay in town and monitor the Ebola response. He was calling foreign leaders and U.S. lawmakers to discuss what more must be done, the White House said, and bringing his Cabinet members together on the matter. In remarks delivered before a House committee, the hospital's chief clinical officer, Dr. Daniel Varga, admits mistakes were made during Thomas Eric Duncan's care when he first arrived at the hospital's emergency room. In a hearing on Capitol Hill, the chairman of a House committee cited "demonstrated failures" in the government's response. Rep. Tim Murphy of Pennsylvania said the "trust and credibility of the administration and government are waning as the American public loses confidence each day." Seated before him were leaders of the Centers for Disease Control and Prevention and the NIH. Dallas County Commissioners will hold a special meeting Thursday to declare a disaster over "the potential for widespread or severe damage, injury, loss or threat of life resulting from the Ebola virus." Dr. Tom Frieden, director of the CDC, testified that despite the latest incidents, "we remain confident that our public health and health care systems can prevent an Ebola outbreak here." In his prepared testimony, the Texas hospital's chief clinical officer, Dr. Daniel Varga, admitted the facility had made mistakes in Duncan's initial treatment, he apologized for that. "We did not correctly diagnose his symptoms as those of Ebola," Varga said. "We are deeply sorry." Duncan was initially sent home from the emergency room with antibiotics for his high fever, despite saying he'd come from Liberia. In Europe, Spain's government is wrestling with treatment questions, too. The condition of a nursing assistant infected at a Madrid hospital appeared to be improving, but a person who came in contact with her before she was hospitalized developed a fever and was being tested Thursday. 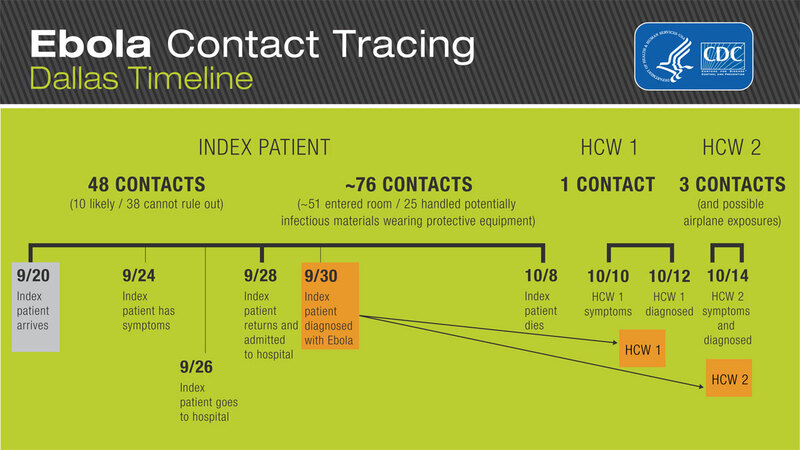 Here is a timeline chart that CDC Director Dr. Thomas Frieden shared at a congressional hearing Thursday showing the monitoring of contacts of U.S. Ebola patients as of Oct. 15. To this point, only hospital workers -- the Madrid nursing assistant and the two nurses in Dallas -- had been known to have contracted Ebola outside West Africa during the outbreak that began in March. U.S. Secretary-General Ban Ki-moon said a trust fund he launched to fight Ebola, with a $1 billion goal, has a paltry $100,000 in the bank. He appealed to nations to do more about a "huge and urgent global problem that demands a huge and urgent global response." Some $20 million has been spent from the fund. France said that on Saturday it will begin screening passengers who arrive at Paris' Charles de Gaulle airport on the once-daily flight from Guinea's capital. In the U.S., Customs and health officials at airports in Chicago, Atlanta, suburban Washington and Newark, New Jersey, were to begin taking the temperatures of passengers from the three hardest-hit West African countries Thursday. The screenings, using no-touch thermometers, started Saturday at New York's Kennedy International Airport. Frieden said investigators are trying to figure out how the nurses caught the virus from that Liberian patient, Thomas Eric Duncan. In the meantime, he said, their cases show a need to strengthen the infection-control procedures that "allowed for exposure to the virus." Hospital: "We Made Mistakes" and Are "Deeply Sorry"
Duncan's death and the sick health care workers in the U.S. and Spain "intensify our concern about the global health threat," said Dr. Anthony Fauci, director of the Institute of Allergy and Infectious Diseases at the National Institutes of Health. A nurse at the Dallas hospital, Texas Health Presbyterian, on Thursday described a "chaotic scene" when the hospital faced Duncan, its first Ebola patient. Briana Aguirre, who has helped treat the first nurse who was infected, told NBC's "Today" show she felt exposed in the protective gear the hospital provided. "In the second week of an Ebola crisis at my hospital, the only gear they were offering us at that time, and up until that time, is gear that is allowing our necks to be uncovered?" Aguirre said, adding that she piled on gloves and booties in triplicate and wore a plastic suit up to her neck. 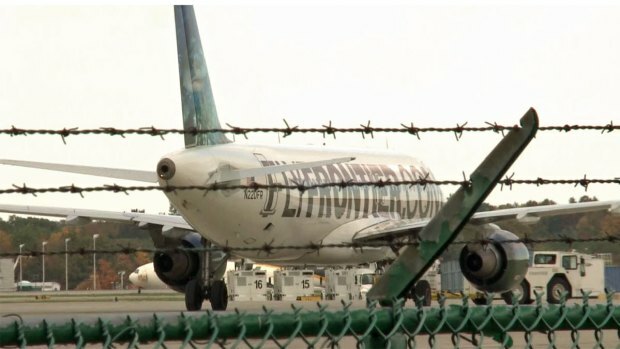 Still, a CDC official cleared Vinson to board the Frontier Airlines flight from Cleveland to the Dallas area. Her reported temperature -- 99.5 degrees -- was below the threshold set by the agency, according to agency spokesman David Daigle. 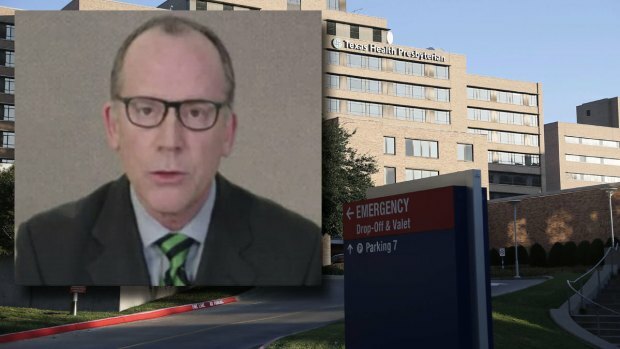 Dallas Nurse Slams Hospital: "We Never Talked About Ebola"